Who's pulling the strings at the secretive American Legislative Exchange Council's (ALEC) conference in Dallas, Texas, this week? According to material obtained by the Center for Media and Democracy (CMD) and Greenpeace, Big Oil and King Coal are heavily represented at ALEC's 41st Annual Meeting. In ALEC task forces, lobbyists vote as equals with state legislators from across the U.S. on industry-friendly legislation, much of which has devastating impacts on our environment, and corporations underwrite parties and trainings where their lobbyists get unparalleled access to lawmakers from almost every state. 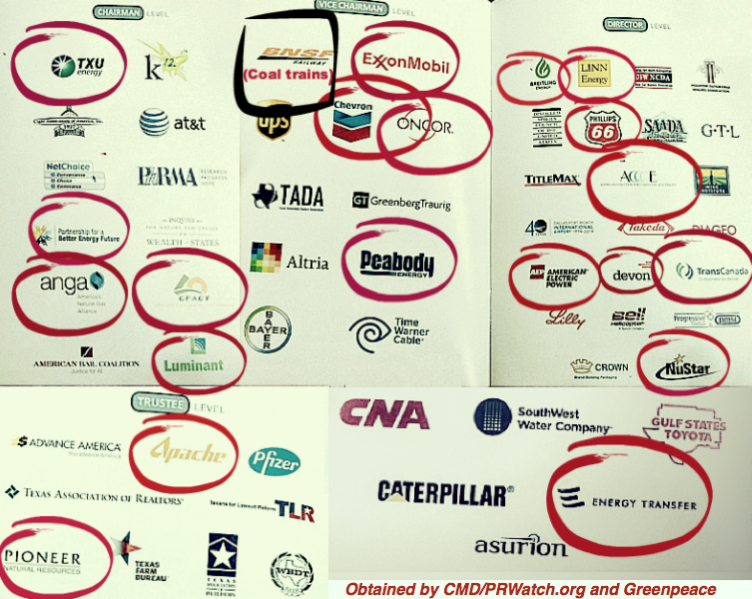 One-third of the official ALEC conference sponsors are dirty energy companies, their trade associations, and their political front groups. The sessions on the ALEC agenda reflect the financial interests of these sponsors. According to ALEC's conference agenda, lobbyists instructed legislators how to “talk” and “think” about climate change on the first day of the meeting, clashing with ALEC's recent insistence to the press that its operations are "completely legislator driven." Legislators also received a briefing from a scientifically irrelevant climate change denial group, the “Nongovernmental International Panel on Climate Change” (NIPCC), published by a fossil fuel front group that infamously compared climate advocates with "murderers, tyrants and madmen." In keeping with ALEC's longtime denial of both the science and solutions to climate change, Oklahoma Attorney General Scott Pruitt, a Republican, spoke about proposed Environmental Protection Agency (EPA) limits on carbon pollution. That session was sponsored by the world’s largest publicly owned coal company, Peabody Energy, and the trade association for the coal industry, the American Coalition for Clean Coal Electricity (ACCCE), of which Peabody is a member. Other agenda items include a presentation to legislators on the federal government regulating pollution from coal plants and a session on increasing the export of fracked gas from the U.S., likely a result of new ALEC member companies like Cheniere Energy, a liquid natural gas export company. All of this was set to prepare lobbyists and legislators to sit down, during ALEC’s Energy, Environment and Agriculture task force, to vote together on a new proposed ALEC “model” bill in opposition to the EPA limiting carbon from coal plants. Members of this task force have declared "guerrilla warfare" on the EPA's newly proposed rule. See additional details about what else is on ALEC's conference agenda here.